Summer's HOTTEST Snacks & Beverages! Summer is here! It’s time to relax and enjoy some new tasty treats and beverages! Whether you’re traveling, sending the kids off to summer camp, going on a day trip to the beach or hanging out around home we have the perfect snacks and beverages that are perfect for everything! We have tried hundreds of snacks (was a tough job) and hand picked our favorites for you to enjoy! If you are looking for something healthy or even a little unhealthy we have you covered! In addition to their line of Hummus, Sabra offers flavorful Guacamole. Unlike most guacamoles, Sabra’s has a long shelf life (when refrigerated), and comes in travel-sized packs. Their newest "Veggie Fusions" line includes three delicious flavors: Garden Vegetable, South-Western, Mango Lime. These guacamole snack packs taste homemade and are perfect when paired with chips or pretzels! These compact waffles are perfect for a sweet snack on the go! They are a great healthy alternative to a candy bar and taste like a real waffle! They come in 10 flavors: Lemon, Chocolate, Honey, GF Salted Caramel, GF Maple Waffle, GF Cinnamon Waffle, Caramel, Gingersnap, Strawberry, and Vanilla. The honey and chocolate flavors come in a kid’s version as well. Our favorite is the GF Maple Waffle, it has a chewy/soft texture with a real maple syrup glaze. These are great for enjoying with a cup of coffee or tea! These delicious mini cookies are as healthy as they are delicious. Created by a mother of a child with food allergies, these cookies were especially made for people with special diets so that everyone can enjoy tasty treats! All cookies are allergy free, gluten free, vegan and made in a bakery free of peanuts, tree nuts, eggs, dairy, wheat and gluten. There are six flavors: Chocolate Chip, Double Chocolate Chip, Vanilla, Lemon Burst, Chocolate Mint and Ginger Snap. The chocolate chip cookies come in both mini and regular size and all other flavors are available in travel-sized snack packs. Although these cookies are made without traditional ingredients, they taste great! The lemon flavor tastes very similar to the Girl Scout cookie, “Savannah Smiles” but is made with much healthier ingredients. These cookies are a great snack that everyone can enjoy! ​ A healthy alternative to tortilla chips, these rice chips are packed with flavor and made with clean, organic, whole-grain ingredients. The rice chips come in 10 flavors: Smoky Maple, Siracha, Chesapeake Bay Style Seasoning, Fiesta Lime, Honey Dijon, Pico De Gallo, Santa Fe Barbecue, Sea Salt, Sesame Seaweed and Wasabi. ​The smoky maple flavor is one of our favorites—it has a perfect crunch, and a barbeque glaze that is both sweet and savory. These chips are very filling so they are a perfect substantial snack to have that will stay with you throughout the day. You can eat them plain, with any type of dip or on top of a soup or salad! Chips have never been healthier—these fruit and veggie chips are made with simply two ingredients. These chips are made with real fruit/veggies and baked with pure cane sugar sprinkled on top. Coming in four flavors (Pineapple, Mango, Coconut and Beet), these are a healthy alternative to the traditional potato chip. They have a satisfying crispy consistency and are packed with natural flavor. They come in travel-sized packs are perfect for eating plain or sprinkled on top of a salad! 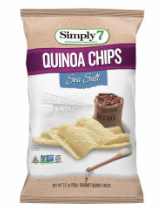 Another healthy alternative to potato chips, these quinoa chips are gluten free, non-GMO, vegetarian, kosher and contain no trans fats, artificial colors/flavors or preservatives. They have a unique nutty flavor, are light/airy and have a nice satisfying crunch. They come in 5 flavors: Sea Salt, Salt & Vinegar, Barbeque, Cheddar and Sour Cream & Onion. Saffron Road Baked Lentil Chips and Bean Stalks: These nutritious snacks are the epitome of modern snacking. They are gluten-free, low fat and made with the flour of real legumes. The lentil chips are packed with protein—providing 4 grams per serving, and packed with natural flavors. So not only are they nutritious and filling, but they are tasty as well. There are six flavors of the baked lentil chips: Sea Salt, Cucumber Dill, Garlic Parmesan, Moroccan Barbeque, Rosemary and Cracked Pepper. The Bean Stalks contain 3 grams of protein per serving and have a satisfying crunchy texture and mouth-feel. There are three flavors available: Sea Salt, Cheddar and Barbeque. The cheddar flavor is so tasty that they are comparable to Cheetos! Deep River makes the quintessential kettle cooked potato chips. With the perfect amount of crunch and added flavor, they are addictive! The Aged Cheddar Horseradish chips are strong and have a delayed horseradish-y bite to them and the Zesty Jalapeño flavored chips surprise you with a burst of spicy jalapeño. The chips come in a variety of flavors - thirteen flavors to be exact including our favorites: Mesquite BBQ, Ninja Ginger, Salt and Cracked Pepper and more! RW Garcia has just launched three Pulse Chip varieties that are a delicious source of protein! The chips are both high in fiber and low in fat. They come in three different flavors which include: Black Bean & Ancient Grains, Chickpea & Ancient Grains and Lentil & Ancient Grains. These delicious snacks are free of additives and preservatives and make a wonderful healthy snack that you can pair with salsa or hummus! A healthy alternative to regular potato chips, Simply 7 Veggie Chips are organic, gluten free, non-GMO, kosher and contain no trans fats, artificial colors/flavors or preservatives. They are made with veggies like spinach and potato. The chips are light and have a nice satisfying crunch! With less than 1g of sugar and only 130 calories per serving, you can finally enjoy a snack that’s better for you! They make a great snack for on the go that provide both nutrition and taste! These bars are packed with natural energy and are non-GMO, gluten free and contain no artificial preservatives, flavors or colors. They are dense, filling and the perfect pre/post workout snack. Flavors include: Dark & Tempting (balsamic fig and hazelnut), Salted Decadence (dark chocolate & almonds), Irresistible Dark Chocolate (strawberries & pistachios), Indulgent (dark chocolate & hazelnuts), Harmonious Blend (Marcona almond and apricot) and Sweet Tart (berry bliss). There are also kids bars that come in three flavors: chocolate banana, apple cinnamon and oatmeal chocolate chunk. Each bar is filled with protein and a unique blend of natural ingredients. Your kids will fall in love with these chewy granola bars. Comparable to Quaker “Chewy” granola bars, these bars are USDA Certified Organic and a Non-GMO verified. These bars area also very dense and filling—making it the perfect substantial and satisfying snack for kids or adults. They come in a variety of flavors such as chocolate chip, Peanut Choco and Berry Blast! Made with organic superfoods, these bars are both loaded with nutrition and provide lasting energy. They have a chewy texture and are the perfect size to pack when traveling. The five flavors are: Dark Chocolate Cranberry Almond, Roasted Peanut Dark Chocolate, Mocha Cocoa Hazelnut, Blueberry Cashew Pumpkin Seed and Nuts & Seeds & Sea Salt. ​Each bar is made with perfect combinations of carefully selected ingredients, making it the perfect healthy snack. ​These organic purple corn flakes are made with just three ingredients: organic purple corn, organic cane sugar and sea salt. They’re the perfect whole-grain cereal to incorporate into your breakfast everyday. With 4g of protein per serving, this cereal is more substantial and filling than most others and can be served plain, with milk or with yogurt. Known for their sandwich crackers, Lance just came out with a “PB & J” line—incorporating both jelly and peanut butter sandwiched in between two crackers. The crackers are buttery and the peanut butter is filling. The snack packs come with six cracker sandwiches in them and are perfect for on-the-go activities. A great spin-off from the original Milano cookie, these mocha-flavored treats are absolutely decadent. These cookies contain the perfect ratio of mocha and chocolate. ​The chocolate inside is creamy and rich and the cookies are sweet and crunchy. These are the perfect indulgent snack or dessert! For a bite-size bite super packed with protein, Hemp Heart Bites are a snack that's super convenient to take with you on the go! These Hemp Heart Bites have 10 grams of protein and 10 grams of omega 3 and omega 6 in each 45-gram serving (about 8 pieces). So next time you’re having a mid-day snack attack, reach for something that will help fuel your active lifestyle and get you through even the busiest day! They come in three delicious flavors including: Original, Chocolate, and Cinnamon! Brewla has a unique line of specialty brewed bars that are both refreshing and delicious! All six flavors of the Brewla bars are gluten free and kosher. They are all also low in calories and come in creative flavors such as Peach Ginger + White Tea, Strawberry + Hibiscus Tea and their Barista flavor which features cold-brewed coffee! A Brewla bar makes the perfect snack for a hot summer day! ​Shine Organics has created a pouch that's both healthy and delicious. ELEVATE uplifts your mood and helps you power through those long summer days! ​The delicious snack blends contain a hint of turmeric and wheat grass combined with carrots and mangoes for an orange-hued blast of antioxidants vitamin A and C. Your daily routine has been waiting for this! This alcohol-free beverage is custom-made for everyone to enjoy! 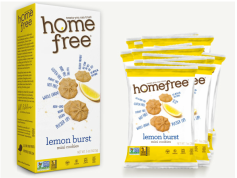 They are made with no preservatives or high fructose corn syrup and are gluten, allergy and BPA free. They can be served with or without a splash of alcohol, but either way they taste like the real deal. There are four flavors: Karma Sucra Cosmopolitan, Vida Loca Margarita, Sevilla Red Sangria and Scottish Lemonade Whiskey Sour. The packaging for each drink is especially unique and convenient as it is shaped like a “shaker”. To prepare, all you have to do is add ice and shake! These drinks are perfect for fun summer nights out. ​Summer is finally here and that means one thing…refreshing cocktails! Whether beach bumming with your friends or hosting a backyard barbeque, Blue Ice Vodka helps quench the relentless summer thirst. Mix Blue ice with your favorite juice or soda or make a refreshing Moscow Mule by adding ginger beer and simple syrup! This handcrafted american potato vodka is gluten-free and the perfect addition to any party or BBQ this summer! 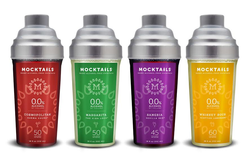 This line of all-natural, zero-calorie cocktail mixers are the perfect solution to instantly making tasty mixed drinks. Each 4 oz. single-serve bottle is perfect for making easy drinks at home or bringing along with you while going out for the night. There are three flavors available: Ginger Lime, Cucumber Mint and Margarita. The mixers can be added to a variety of base spirits such as vodka, whiskey, tequila, beer and wine. They are also great for people with limited diets because they are made with no added sugar or artificial ingredients! ​Viniq is a jaw dropper for anyone who hasn’t had the chance to experience its shimmer and fruity taste! When fused with Premium Vodka, Moscato, and Natural Fruit Flavors, this tasteless, odorless pearly color is what elevates Viniq to the complete package. With a sweet taste and a one-of-a-kind look, Viniq is a head turner. Serve alone or as a mixer. Just shake to shimmer. Viniq is a fabulous way to sweeten up the Summer! ​Summer is finally here and that means one thing…refreshing wine! LBD Rosé is Pure Pink Satisfaction. Crafted by winemaker Margaret Leonardi at the brand’s winery in Mendocino Country, CA, LBD Rosé is 54% Gewurztraminer, 23% Muscat, 14% Chardonnay, 5% Zinfandel, and 4% other complementary white varietals. With it's light refreshing sweet taste, lbd Rosé is the perfect wine for a day at the beach, summer cocktail party and just about anywhere you venture to this Summer! ​Summer is the time for picnics and parties at the beach. Whatever the occasion, Villa Pozzi has the perfect light and sweet Moscato Wine! The grapes in this crisp and refreshing wine are from the inner area of Petosino, which is in the North-West part of Sicily. The Moscato features fresh aromas of figs, apricot and orange flowers. The Villa Pozzi Moscato is the perfect wine for a romantic date or a refreshing wine for a Summer Party. Make sure to bring enough to share! ​Summer and Sangria were made for each other, however making Sangria can be a long process. Eppa SupraFruta Red Sangria makes your life and parties easy with a delicious blend crafted of organically grown grapes and fruit. The Sangria contains nearly two times the antioxidants of red wine, which is the result of using real organic superfruits like blueberry and pomegranate. Now you can not only enjoy your Sangria but your body will benefit from it! When eating anything, on any sort of diet, it is always smart to keep your gut health in mind. This liquid mineral supplement can be taken before or after every meal to restore good gut bacteria resulting better immune function and mental clarity. ​This unique dietary supplement is plant-derived and creates a firewall against toxins entering the gut wall. With daily use, your body will be better protected against disease and you will feel less tired! All you have to do is take a teaspoon with every meal. 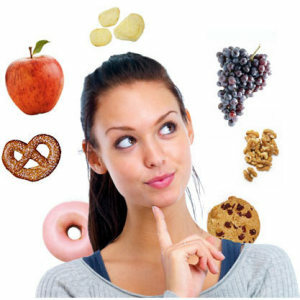 In addition to healthy snacking you need to maintain a healthy diet. To help with that, including Vida Glow Marine Collagen in your daily diet will help stimulate your body’s natural supply of collagen, increasing elasticity, hydration and firmness in your skin, as well as repairing weak or brittle nails. This product also assists in the growth and strengthening of your hair, adding extra shine and helping rejuvenate dry or damaged hair. ​Collagen is a protein that is vital to maintaining healthy muscles and connective tissues. Therefore your tendons, ligaments and cartilage greatly benefit from taking Vida Glow marine collagen, notably preserving joint and bone health and encouraging muscle toning and definition.